Summary: When you're running away from a broken heart, there's only one place to go...Adjusting tiaras at the foot of the aisle, Angela and her best friend prepare for the wedding of the year. But events don't go as planned. And when a girl is in possession of a crumpled bridesmaid dress - and can't go home - New York (for the very first time) seems like an excellent idea. Angela's new friend Jenny Lopez gives Angela a whirlwind tour of the city that never sleeps, and a makeover. Who hasn't dreamed of starting afresh with a sassy New York wardrobe, a new haircut and a trip to the make-up counter? Before she knows it, the new Angela is getting over her broken heart by having dinner with two different boys. And, best of all, she gets to write about it in her fabulous new blog. But it's one thing telling readers all about your romantic dilemmas. It's another trying to figure them out for yourself! Review: Firstly, I've wanted to get hold of these books for what seems like forever! Yep, I know I'm way behind compared to some of you, but this series kept passing me by. 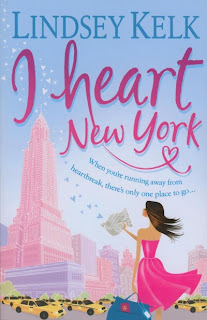 The funny thing is I was on holiday in California when I got around to reading I heart New York. Angela is a brave you woman, who has discovered that her fiancee isn't who she thinks he is, and in discovering this she flees to New York. Brave and some may say stupid but Angela transforms her life for the better and in doing so she made me look to the future with a positive mind. This novel will have you hooked as it is just like reading your best mates blog...from the first few chapters I was well and truly hooked by Lindsey Kelk's feel good summer read. Angela is a loveable character who you will cheer on throughout, as a reader all you want is for her to be happy. She is inspiring by the way she changes her life, sometimes all it takes is a haircut, and I really do believe that as recently I had a well needed haircut and it made me feel like a totally different person. When Angela meets Jenny at first I was dubious until I realised that they both needed each other, what a rollercoaster ride these girls go on. It's as if they both needed each other, and they found each other just at the right time. I loved all the twists and turns and I really enjoyed seeing Angela get her confidence and her life back, I cannot wait to read the rest of this series and to delve further into the wonderful world of Lindsey Kelk.